There is no information in Emily Dickinson's poems that separates her from us. She works the seams of language through her mastery of rhetoric and poetic form. She extracts from words "amazing sense." Instead of merely referring to the experience of the writer, the poem is made to be an experience for the reader, which is precisely how she says she knows poetry in her famous remark to Higginson: "If I read a book [and] it makes my whole body so cold no fire ever can warm me I know that is poetry. If I feel physically as if the top of my head were taken off, I know that is poetry. These are the only way I know it. Is there any other way"
No, there isn't. Dickinson is the only poet about whom I consistently feel, "I wish I could write like that." My ambition to understand her inside out is to absorb all she can give me, but her rigorous attention to paradox and its manifold exfoliations are beyond me. The inimitable stylistic manifestation of this attention is most apparent in her usage not her vocabulary�condensing predications and changing grammatical classes of words much more than using specialized and obscure meanings of them (although there is a little of that, too). To cite just one example: "The Daily Own - of Love/ Depreciate the Vision" (426)�as Cristanne Miller says in A Poet's Grammar�"creates a kind of parataxis, for which the reader must work out the appropriate relationship." A verb ("Own") is the subject of a sentence that also violates rules of subject-verb agreement ("The Own�Depreciate"). Dickinson makes the reader participate in the poem, to follow its twists and fill in its (sometimes unfillable) blanks. Her style is in the service of truth: truth-telling and truth-discovering: "Truth is such a rare thing it is delightful to tell it" (as Higginson reported she said to him). She jolts us with it. And she jolted herself. The knocked-off top of her head must have spent a good deal of time on the floor next to her desk. The occasional difficulty and irresolvable ambiguity of her poems is incidental to their knocking my head off, too. That difficulty is more in what is being said than in how it's being said. She is never more difficult than she has to be, but she is committed to being exactly that difficult (and that easy), and her figuration and condensation are sometimes necessarily dense and usually unusually intense. So the so-called "enigma of Emily Dickinson" is not an enigma to me at all. Everything we need to know about her is in those 1789 poems. They are a spiritual autobiography more comprehensive than any possible narrative. They are both the product and practice of a lifetime act of love on her part, if love can be a necessary action ("My business is to love," she declared. "My business is to sing."). Definition poems, observation-of-nature poems, arresting-moment-dramatized poems, declaration-after-experience poems, working-what-she-thinks-of-the-experience-in-the-poem poems, lyric cries, locked-up aphorisms, arguments and narratives, purposeful inconsistency, jazzing the placeholders, banging and angling language until it renders the otherwise inarticulate human feeling: the variety of the poetry she extracts from a single limited form�a liturgical form (the hymn stanza)�is astonishing. I would like to have a fraction of her focus: the most intense focus ever of any writer I know. She is a model of devotion to the practice of poetry. Writing poems for her was life-sustaining, even life-creating. It created the place in which she fully experienced her experience. What she made in her poems she used in her life. The process of writing and all it involved grew her soul. It was a spiritual discipline, the lifelong practice of a craft, and an entertainment. When after a few years out of touch, Higginson asked if she was still writing, she responded, "I have no other Playmate." The idea that either poetry or religion was separable from life was repugnant to her. Art for art's sake would have struck her as a ludicrous, debased idea. The foundation and purpose of art was moral and religious, as it was for every poet of her time except Poe, but, unlike the Victorian sages, for her the relationship between art and morality was implicit not explicit, private not social, neither pious nor privileged but enmeshed with gritty, difficult, daily life, and every crack and crease in their connections was open to exploration. I am very grateful she did this work. It is one of the greatest enrichments of my life. Wild Nights � Wild Nights! As freezing persons recollect the snow. First chill - then stupor - then the letting go. Despite Dickinson's prolific writing, fewer than a dozen of her poems were published during her lifetime. After her younger sister Vinnie discovered the collection of nearly eighteen hundred poems, Dickinson's first volume was published four years after her death. Until the 1955 publication of Dickinson's Complete Poems by Thomas H. Johnson, her poetry was considerably edited and altered from their manuscript versions. Since 1890 Dickinson has remained continuously in print. A few of Dickinson's poems appeared in Samuel Bowles' Springfield Republican between 1858 and 1868. They were published anonymously and heavily edited, with conventionalized punctuation and formal titles. The first poem, "Nobody knows this little rose", may have been published without Dickinson's permission. The Republican also published "A narrow Fellow in the Grass" as "The Snake"; "Safe in their Alabaster Chambers �" as "The Sleeping"; and "Blazing in the Gold and quenching in Purple" as "Sunset". The poem "I taste a liquor never brewed �" is an example of the edited versions, the last two lines in the first stanza were completely rewritten for the sake of conventional rhyme. 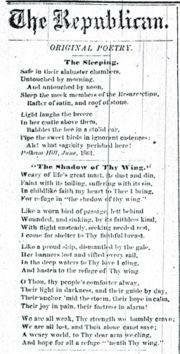 In 1864, several poems were altered and published in Drum Beat, to raise funds for medical care for Union soldiers in the war. Another appeared in April 1864 in the Brooklyn Daily Union. In the 1870s, Higginson showed Dickinson's poems to Helen Hunt Jackson, who had coincidentally been at the Academy with Dickinson when they were girls. Jackson was deeply involved in the publishing world, and managed to convince Dickinson to publish her poem "Success is counted sweetest" anonymously in a volume called A Masque of Poets. The poem, however, was altered to agree with contemporary taste. It was the last poem published during Dickinson's lifetime. After Dickinson's death, Vinnie Dickinson kept her promise and burned most of the poet's correspondence. Significantly though, Dickinson had left no instructions about the forty notebooks and loose sheets gathered in a locked chest. Vinnie recognized the poems' worth and became obsessed with seeing them published. She turned first to her brother's wife and then to Mabel Loomis Todd, her brother's mistress, for assistance. 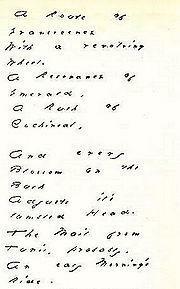 A feud ensued, with the manuscripts divided between the Todd and Dickinson houses, preventing complete publication of Dickinson's poetry for more than half a century. Safe in their Alabaster Chambers �," entitled "The Sleeping," as it was published in the Springfield Republican in 1862. 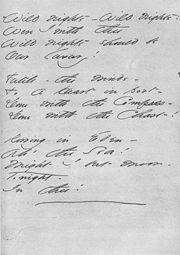 Dickinson's handwritten manuscript of her poem "Wild Nights � Wild Nights!" Dickinson wrote and sent this poem ("A Route to Evanescence") to Thomas Higginson in 1880. Emily Dickinson was born in Amherst, Massachusetts, in 1830. She attended Mount Holyoke Female Seminary in South Hadley, but severe homesickness led her to return home after one year. Throughout her life, she seldom left her house and visitors were scarce. The people with whom she did come in contact, however, had an enormous impact on her thoughts and poetry. She was particularly stirred by the Reverend Charles Wadsworth, whom she met on a trip to Philadelphia. He left for the West Coast shortly after a visit to her home in 1860, and some critics believe his departure gave rise to the heartsick flow of verse from Dickinson in the years that followed. While it is certain that he was an important figure in her life, it is not certain that this was in the capacity of romantic love�she called him "my closest earthly friend." Other possibilities for the unrequited love in Dickinson�s poems include Otis P. Lord, a Massachusetts Supreme Court Judge, and Samuel Bowles, editor of the Springfield Republican. By the 1860s, Dickinson lived in almost total physical isolation from the outside world, but actively maintained many correspondences and read widely. She spent a great deal of this time with her family. Her father, Edward Dickinson, was actively involved in state and national politics, serving in Congress for one term. Her brother Austin attended law school and became an attorney, but lived next door once he married Susan Gilbert (one of the speculated�albeit less persuasively�unrequited loves of Emily). Dickinson�s younger sister Lavinia also lived at home for her entire life in similar isolation. Lavinia and Austin were not only family, but intellectual companions during Dickinson�s lifetime.